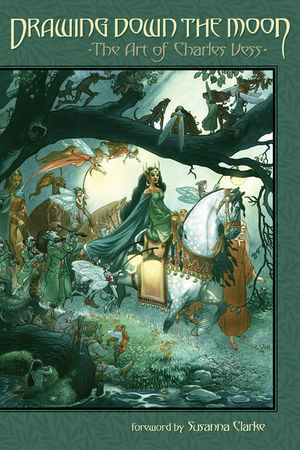 Hands down, one of the most under-celebrated artists of out time is Charles Vess. Everything he has ever done is captivating to both artist geek and plebe alike. I wouldn’t say he is under-rated, everyone know how amazing he is. It’s just I don’t think he gets the name in lights like I think he deserves. Maybe it’s just that he doesn’t hog the mainstream (looking right at you Alex Ross), maybe it’s that he works with equally amazing authors (including Neil Gaiman and Susanna Clark) and his names get pushed aside while reader are swept into fantastical worlds. Who knows? But Dark Horse is releasing a 200 page hardcover collecting his work – and it’s on my Christmas list, should be on yours too!. Click Here for Dark Horse’s preview pages! Description: Verdant fairy forests. Whispering mountains. The fallen towers of ancient kings. Spirit-filled lakes. The distant strains of elven bards. For over thirty years, the fantasy art of Charles Vess has been acclaimed worldwide, his rich palette, striking compositions, and lavish detail second to none in the field. Vess has been the illustrator of choice for countless publishers and writers, including Neil Gaiman, Susanna Clark, and George R. R. Martin. Embodying the timeless approach of the golden age of illustration, Vess’s work is both breathtakingly singular and yet recalls an era when paint and brush were the vessels that carried readers of all ages to distant lands, bygone ages, and realms of the imagination. * Forward by Susanna Clarke, best-selling author of Jonathan Strange & Mr Norrell. * Vess’s awards include The Will Eisner Comics Industry Award, World Fantasy Award, and Spectrum Annual Award.